ASHLAND CITY, Tenn. - Nov. 8, 2018 - PRLog -- Scott Wilson Architect, LLC (www.scottwilsonarchitect.com), an award-winning boutique architect firm located in Franklin, Tennessee, and Shane McFarland Construction (shanemcfarlandconstruction.com), an award-winning, full service custom home builder and commercial construction company, today announced that their renovation of a historic commercial building in downtown Murfreesboro, Tennessee, has won a Silver Award from Qualified Remodeler in the Light Commercial category and a Silver Aurora Award from the Southeast Builders Conference. Originally built in the 1950's, the building, 323 Walnut, had been unoccupied for years. "Most people would have thought this was a tear down," said Shane McFarland, owner of Shane McFarland Construction, which has its offices in the building. "Scott Wilson and his team made our vision come to life and it's now one of the nicest buildings downtown." The project included a complete interior and exterior renovation. The exterior was updated by replacing the exposed textured block sections with energy efficient storefront windows that match the new glass entries. For the interior, the central stairway was rebuilt using reclaimed wood. Scott Wilson designed spaces to best serve the four separate office suites. Wide-open spaces were created for a salon tenant. For a medical services company, which includes a masseuse and acupuncturist, the design inverted the space with a hallway around the outside, enhancing the privacy of the interior rooms. Scott Wilson, founder and Chief Manager, Scott Wilson Architect, LLC., noted that McFarland Construction found many ways to keep costs down while maintaining the integrity of the design. "It takes a team. The architect comes up with a creative solution and the builder has to produce it within budget," Wilson observed. "Finding and using reclaimed wood for the stairs was a good decision for sustainability and it makes for good design. That's good value engineering." Wilson was especially gratified that the project reclaimed a portion of mid-1950's Murfreesboro. "Renovating this building preserves a part of Murfreesboro's history," Wilson concluded. "We're honored to have collaborated with McFarland Construction on this renovation." Qualified Remodeler has presented the Master Design Awards for the past 40 years. Winners are chosen by a panel of judges, selected from among hundreds of submissions. 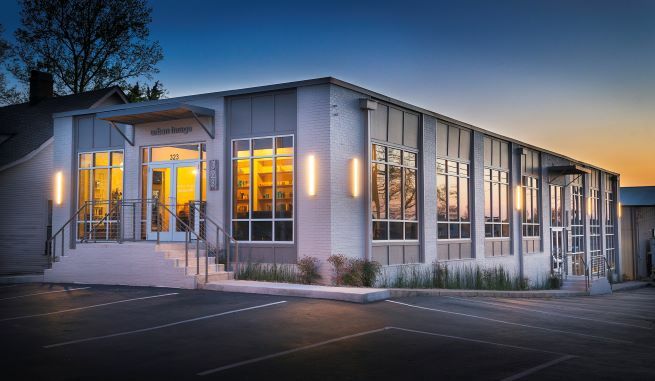 The renovation of the 8000 square foot building was completed in 2017 and was also recognized by the City of Murfreesboro with the Downtown Main Street Design/Build Project of the Year award.